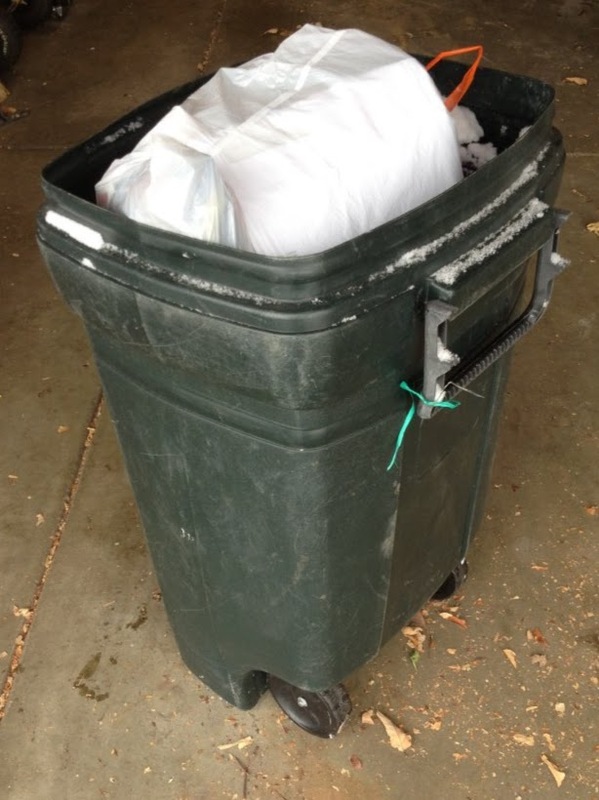 I hate wheeling the trash to the curb on trash day and sometimes I forget. Screw that noise, man. A robot wouldn't mind, wouldn't forget and wouldn't care if it's freezing outside. I'm building Take Out The Trash Robot. TOTT Bot, for short. So there. ServoCity was kind enough to send me a giant box of cool Actobotics parts to evaluate. Seriously. I'm like a kid on Christmas opening the coolest new lego-lincoln-erector-tinker-riviton-toy ever designed! What the Isaac Asimov is Actobotics, you ask? Lots of cool parts. Precise parts. With drill holes in compatible locations. So, it's easier to prototype. 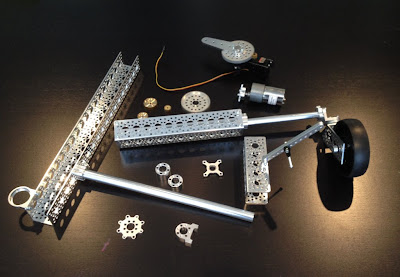 Between the ball bearings, precision shafts and tubing, lightweight aluminum channel, gears, sprockets, chains, belts, and pulleys, not to mention ServoCity motors and giant servos I'm seriously giggling with glee here. Pololu Robotics and Electronics is having its biggest Black Friday sale yet, discounting hundreds of sensors, actuators, motor controllers, and other robot parts by 30% to 60% and offering an additional 11% to 15% off orders over $100! Buy one Zumo Robot and get one free, save on a 3pi Robot and get a free programmer, and take advantage of great deals on select Arduinos, Raspberry Pis, and mbeds. 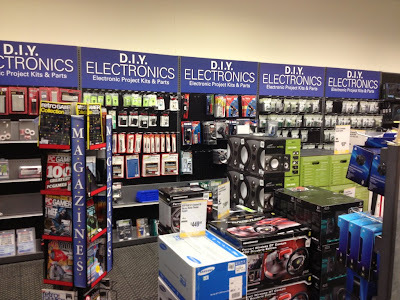 The first doorbuster deals go live Wednesday, November 27, and the sale runs through Cyber Monday (December 2). For details, visit www.pololu.com/blackfriday. Announcing Bot Thoughts Cyber Monday discounts! Details here. My best friend is an artist. His latest blog post features some of the robot head art he's been working on. His prices are reasonable so if you want one, let me know and I'll put you in touch. Use the AVR Watchdog Timer as a sleep delay. 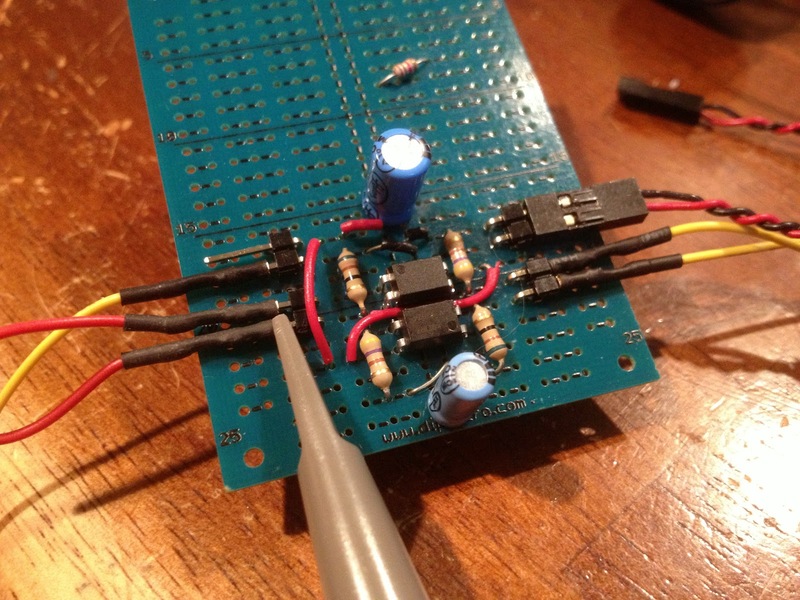 Put your ATtiny / ATmega to sleep and the Watchdog Timer will wake it up after a specified interval. 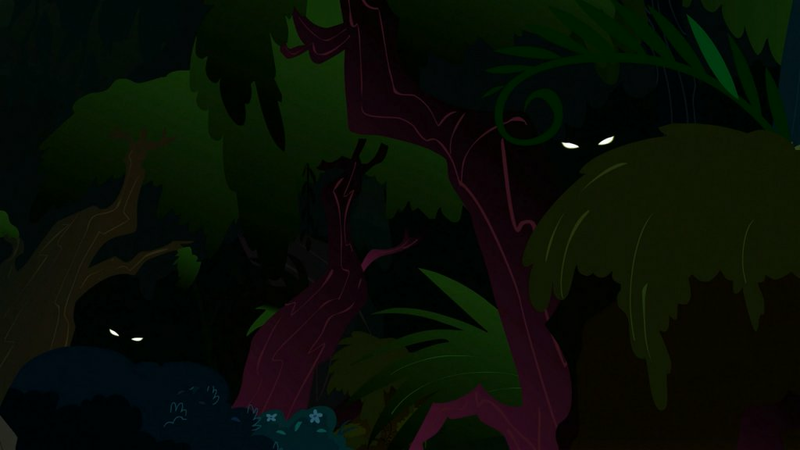 oh no, it's the glowing, blinking eyes of a chupacabra! This is the technique I used for my lost R/C airplane model alarm. I also used it last night for my Halloween glowing, blinky eyes. Here's how. You know how when you talk with geek friends you learn about cool stuff you didn't know about? For the next several weeks, in addition to the regular posts, I'll make a valiant attempt to share some things I think are neat-o in case you haven't heard of them or have but forgot. I'd love to hear your feedback. Could you take a second and post comments good or bad? Thanks. First up is the Electric Imp. It's been around awhile. 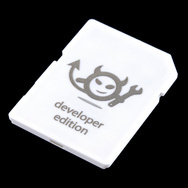 It's a device in an SD card form factor that bridges your widget to WiFi. 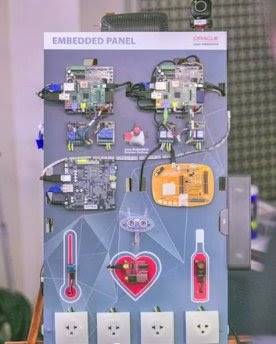 On-board is a transceiver and an ARM Cortex M3. It's programmable via cloud-based development. You can get 'em for $30 at Sparkfun and other places. I haven't played with one yet. I already have a mountain of microcontrollers and other goodies waiting for my time. How about you? On the upside my Rover RC Multiplexer is successfully funded on Tindie. Atmel AVR035 (pdf)) has some tips on code size reduction. Here's what I learned in the real world, reducing my flash-constrained A2D code from 4k down to 1.4k, great because the onboard ATtiny44As only have 4K of flash. 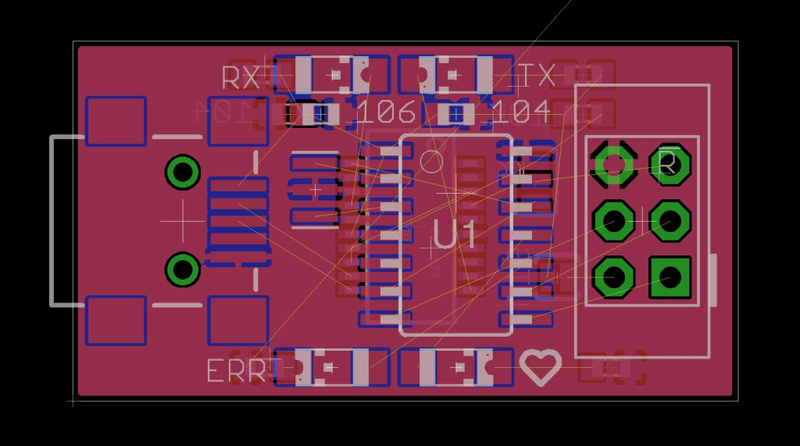 Side note: My A2D boards convert Sharp Rangers or other analog signals to digital -- I2C, and soon SPI and Serial, with oversampling, decimation, and filtering to reduce noise and increase resolution. Congratulations to Ted who kicked all our respective butts in line following at this month's SHARC meeting. He completed the short course in only 5 seconds, less than half of most everyone. Except me--I had an embarrassing 30 second time. Hey I'm just happy mine worked at all, given the failure rate of everything else I've touched the last few days. He and I were both running Pololu 3pi robots. His was nearly maxed on speed but perfectly tuned. I have my work cut out for me if I want to compete next month! 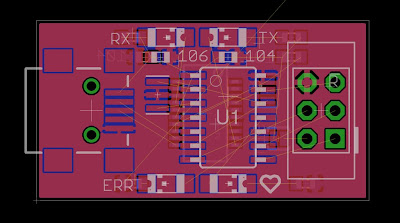 To convert Sharp IR Rangers to I2C, I now use an ATtiny44a for signal processing. The latest Sharp Ranger I2C Adapter prototypes. 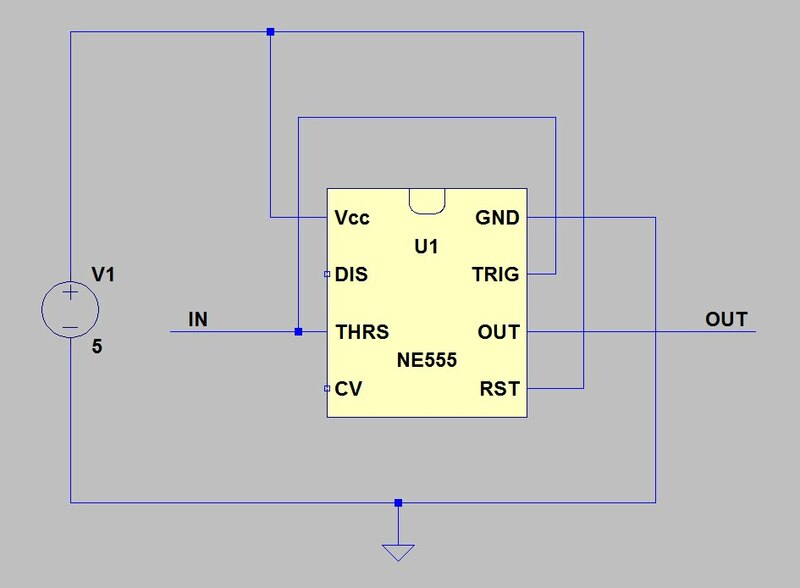 The new approach, guided by Atmel application note AVR121 (pdf), works much better than the dedicated ADCs I was using and will form the core of my Sharp I2C adapter, available soon, after I make a few usability tweaks and finish the firmware. Here's how I improved performance with oversampling and filtering. 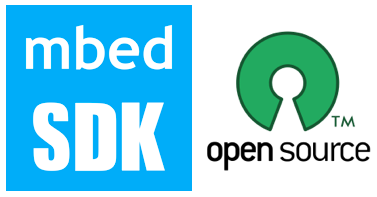 What IDEs do you use for programming? Post in the comments if you would. I'm curious. I use vi, GNU Emacs, Arduino IDE, Geany and Notepad++ and all have advantages, but the editors in "real" IDEs provide numerous sophisticated time-saving benefits for writing code. That isn't to downplay the major advantages of integrated debugging provided by the likes of AVR Studio 4, MPLAB 8.x, and IAR (various targets). While each of these environments are lacking in the editor department, their debugging has saved my bacon more than a few times. 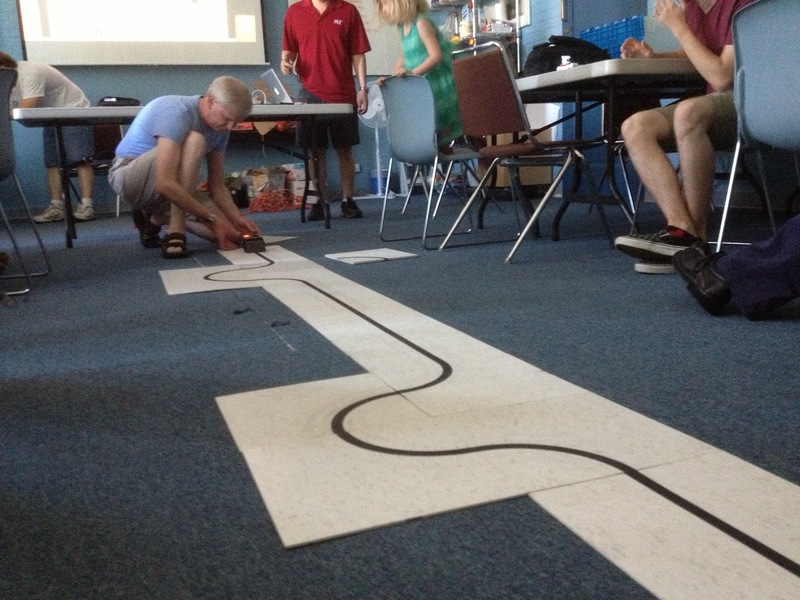 SHARC, the local robot club I attend, has become re-invigorated and will be meeting monthly with line following competitions at the end of every meeting. Our first new meeting was quite a success with good attendance, The line following was fun to watch, however I didn't have any of my line followers ready. Time to enter the fray! I made progress but not enough today, so it's time to be realistic and call it quits for 2013. The robot ran somewhat consistently at the local elementary school but wasn't following the path properly. It knew where it was, the position estimation was in the ballpark, but the robot didn't follow the path it was supposed to. I'm upgrading my chances at the AVC from mostly crap to slim. It would seem I've managed to slay some critical bugs. 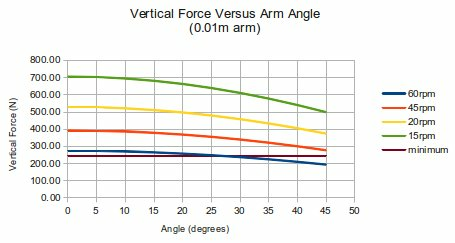 After killing bugs with angle calculation earlier, I found a stupid mistake in the steering angle calculation and problems with the lag compensation. Surely there's two or three more lurking, waiting to make a fool of me. Anyway, the robot successfully completed three short runs outside the house, ending with a track variation of about 2' and a heading variation of about 10 degrees. While this is a big improvement over previous runs, there's still more to do than I'd like. Here's the analysis. Finally, something went right. My chances of success at AVC just went from total crap to mostly crap. Though I couldn't get the new Venus to track satellites, I discovered why the uBlox wasn't working with my code base, fixed it, and it's now tracking lots of satellites. 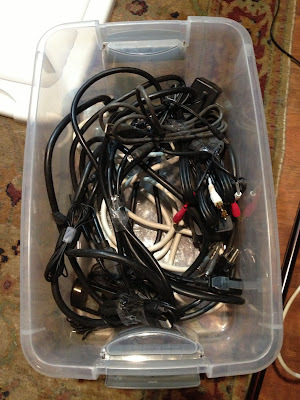 Last we left off, my beloved Venus GPS was dead. Nothing coming out of the TX pin. So I ordered a new one late last week before my out of town trip. It had arrived when I returned but something is wrong; it's unable to pick up satellites worth a darn. Even outside! I have no idea what is going on. What little spare time I've had for testing has been lost to rain. I installed my shiny purple OSHpark baseboard last night. I found and fixed a bug in the estimation code. I was multiplying a heading error tern by a fraction to reduce its influence over time. The difference was normalized to a range of -180 to 180 only after multiplying. It should have been normalized before the multiplication. 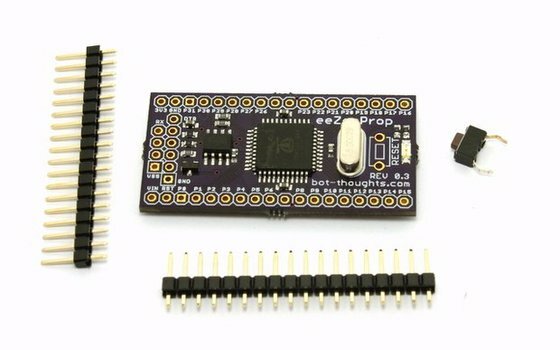 June AVC Sale on Tindie! I mentioned suspicious signals from the encoders. Here's what I was seeing. This is a plot of the distance traveled versus time. 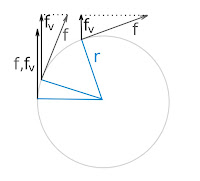 The plot is showing that one of the wheels is able to travel more than 300m in a fraction of a second. Cool. I'm now using a opto-isolators on my GPS to mbed connection, a much better solution than the chokes I used to stamp out RF interference previously. 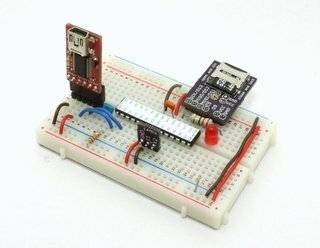 Data Bus mbed baseboards are now available on Tindie as a fundraiser! 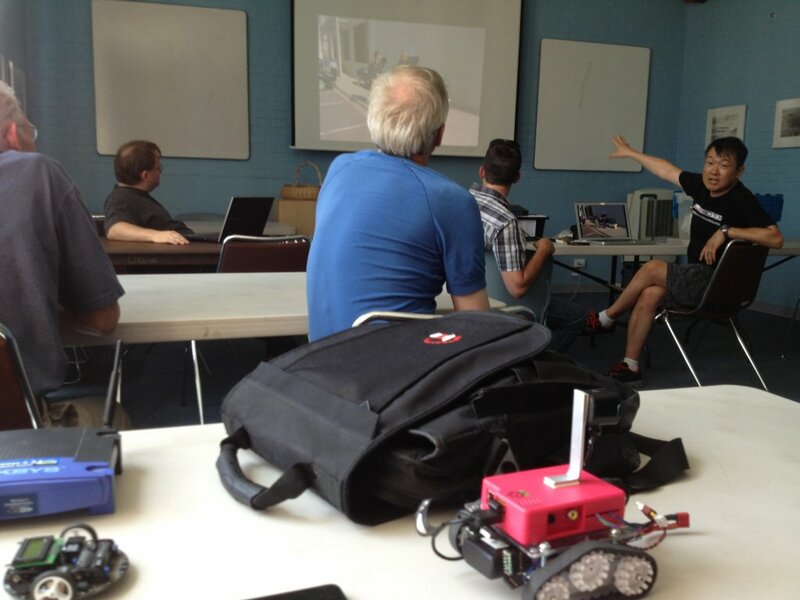 Now you can build your own autonomous rover! This board is the fifth revision of the board that's been powering my AVC-podium-placing rover, Data Bus, the last few years. If you want to experiment with your own algorithms on a powerful 96MHz ARM processor and want a head start on building their 2014 AVC ground vehicle entry, well, here you go! Separate mbed supply rail to keep noise out of your GPS. Just get an mbed, load it up with my code, add an L3G4200D gyro, Venus or uBlox GPS, wheel encoders. I'm evaluating a 3DR uBlox LEA-6 GPS for use on Data Bus to either replace or supplement its current module, the Venus 638FLPX. 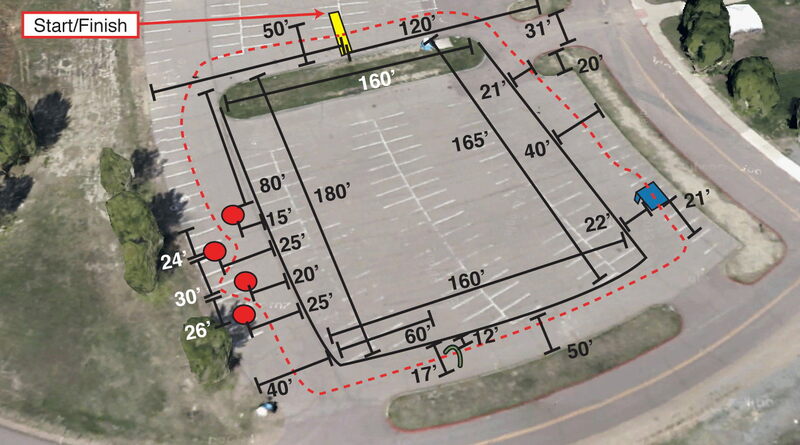 At first the GPS could not obtain a fix. 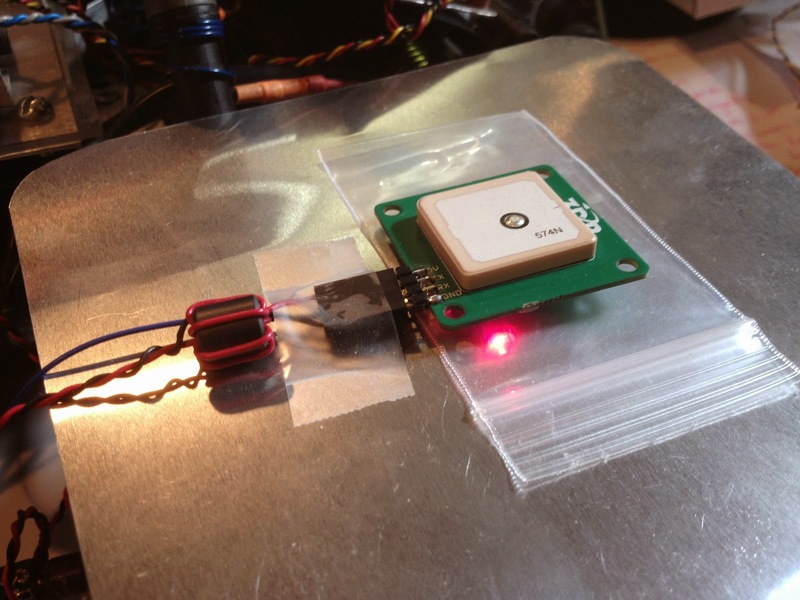 Here's how I brought the GPS from no fix to a 10-satellite fix. From my basement! I built a ramp very similar to the one for the 2013 AVC so I could get a sense of how the robot will handle the jumps. Unfortunately I stripped out one of the plastic idler gears doing a high speed jump. I've got a metal set on order to arrive Friday. 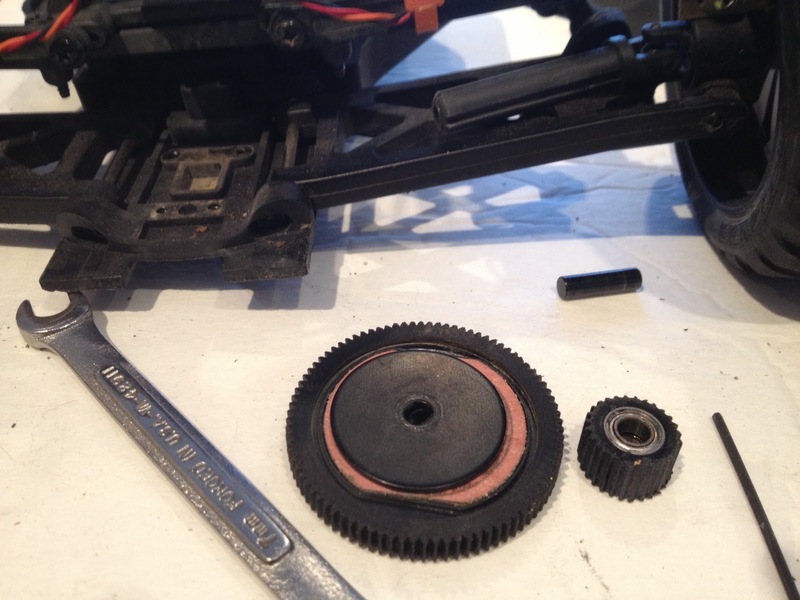 Can you see the stripped teeth on the small idler gear? I was hoping to test my revised path following algorithm. That'll have to wait until I replace the gear set. More on the path following algorithm soon. Just under four weeks left. Here's a demo of Data Bus driving itself around in the rain outside my house. Sparkfun requires a demo submitted before the May 8 deadline. I actually submitted it on the afternoon of May 8, so I hope I'm not too late. Data Bus is configured to travel slowly, around 6 m/s, between four waypoints outside my house. I ran it a few times and it seemed to traverse approximately the same route each time. With only a month left, I guess I can stop procrastinating, now. I'd like to at least get a sense of how accurately I can control its path and make a few improvements before June 8. I am taking time off posting for the next couple weeks due to personal reasons. Last week I was too focused on fuel injection tuning for my Jeep to work on robotics or write articles. Time to look at supply and signal noise on the Sharp IR I2C adapters I'm working on. You often read how noisy these sensors are. Now you can see it for yourself. 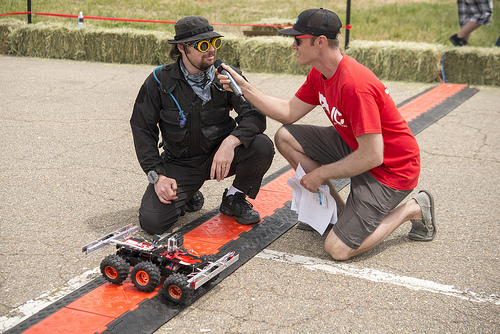 Sparkfun posted the rules and course walkthrough for the 2013 Sparkfun AVC. For us ground vehicle folks the rules are rather different and it really changes up the strategy. If you finish the course you get 300 points from which your time in seconds is subtracted. You get 25 points for every corner you pass. Two bonuses are possible, the hoop from last year earning 50 points and a jump ramp for another 50 points. Finally, every run counts towards your final score. Speed is no longer king. Consistency, accuracy, and precision are. My Propeller VGA kit is $4.75 with 2 days left to order on Tindie. 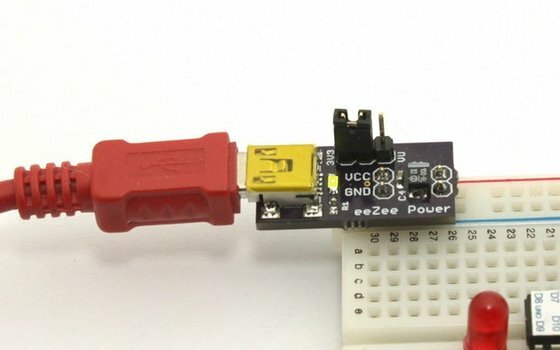 Generate VGA signals with your Propeller with software from the OBEX. Faced with a malfunctioning $8 Goodwill Furby, I set about non-destructive disassembly of my daughter's new sick pet, inspired by the dramatic skinning of a Furby by Becky at Adafruit. I was also inspired by Doc McStuffins. And yes, I was secretly happy the Furby wasn't working; I confess wondering what was inside the moment after I saw the price tag. Don't worry. 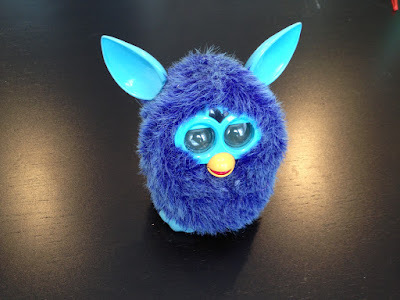 No Furbys were harmed in the making of this blog post. 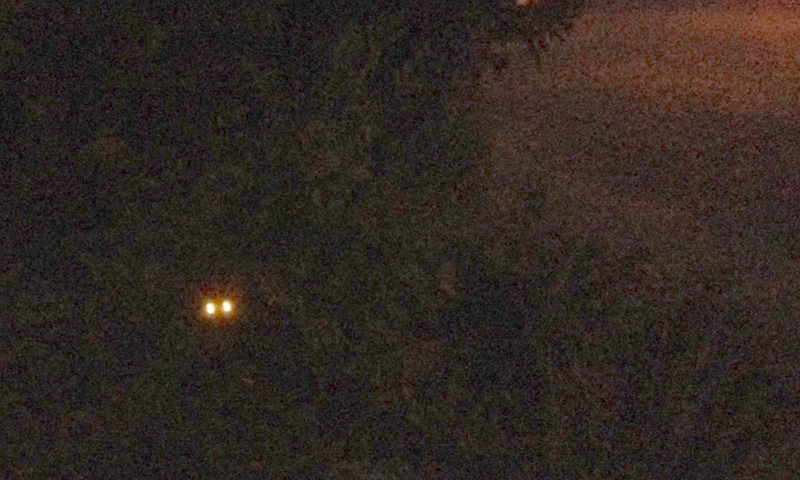 The Furby was making odd chattering noises, strange light fluctuations in the eyes, and shutting off unexpectedly. For awhile the eyes and beak weren't moving in time with speech. New batteries helped a little but this was a sick little fella. Graphic LCDs are excellent debugging tools. 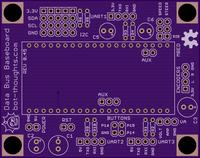 Digole offers an I2C adapter with Arduino library that I've ported to mbed. 128x64 Graphic LCD on Data Bus displays GPS, battery, etc. All the Rev 0.3 eeZee Propellers ordered during the Tindie Fundraiser have been shipped after extensive testing. My test jigs are primitive, but are huge time-savers. One jig programs the board. Another tests VGA. A third tests output pins. I've been playing with Schmitt trigger circuits again, this time using a 555 Timer based on a discussion on diyrovers started by Jason. Schmitt triggers are circuits that provide hysteresis. The concept is simply that instead of one threshold for on and off, there's an upper and lower threshold. With one threshold (red line, U above) a noisy signal can trigger an action more often than intended (A). When there's an upper threshold to trigger on and a lower threshold to trigger off (green lines on U), noisy signals won't trigger falsely (B), so long as the noise doesn't cross the thresholds. To measure speed and distance travelled, Data Bus uses Sparkfun QRE1113 IR reflectance sensor breakout boards and wheel encoder discs printed with WheelEncoderGenerator. On my robot, using QRE1113 reflectance sensors running at 5V, this is the waveform I get. It looks similar to a half-rectified AC signal, about 3V peak and around 1.5V offset. Running on 3.3V, I get a 1.8V peak with 0.9V offset. Either one should be enough to trigger logic circuits. 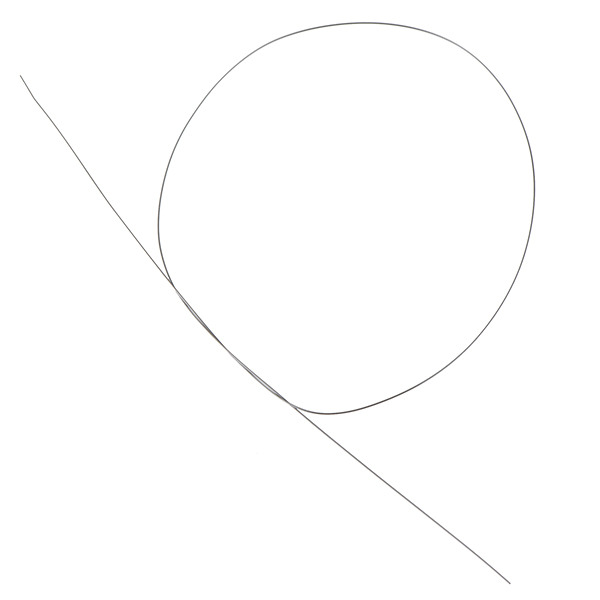 It's not a bad idea to add hysteresis, though. If the sensor is right between encoder stripes, add a little noise and it could trigger more than intended. 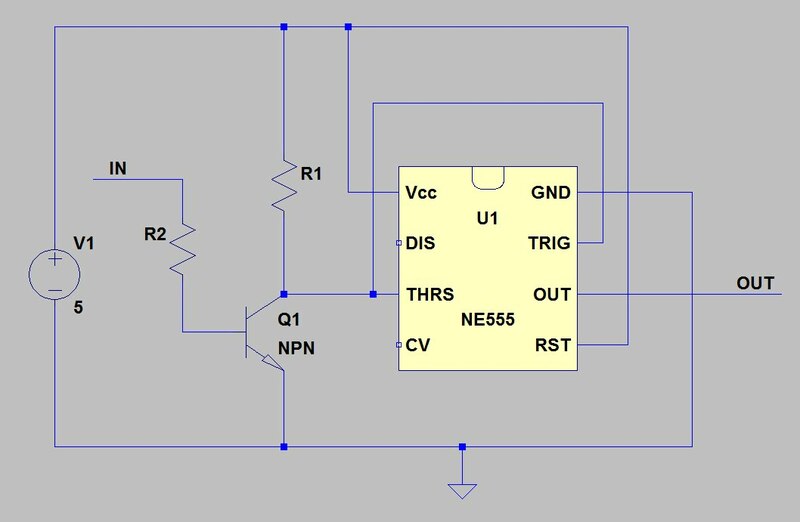 While you can easily find many examples of 555 timers wired to provide hysteresis triggering, and we'll look at the two common ones, a third circuit works better for the wheel encoder system on Data Bus. 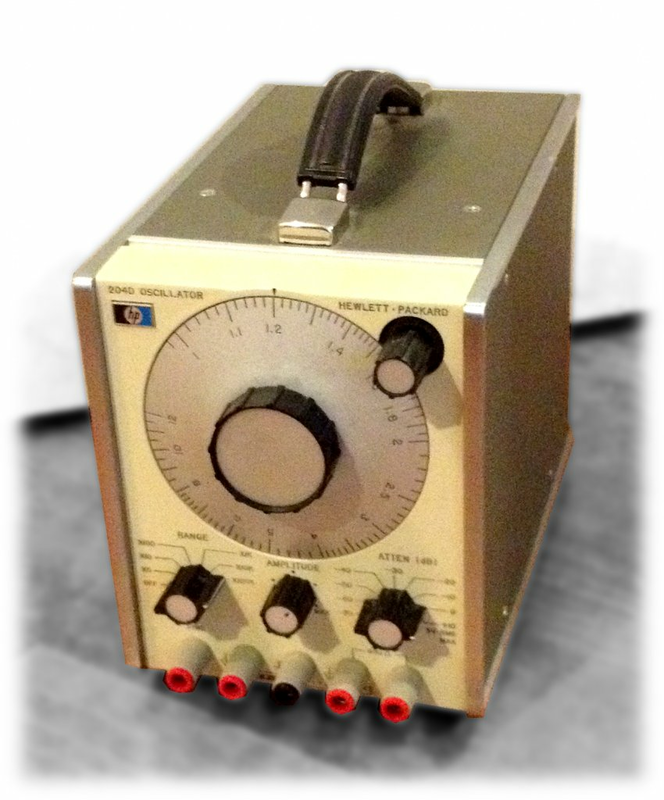 In all cases, the encoder signal is ultimately wired to the Threshold and Trigger pins of the 555. 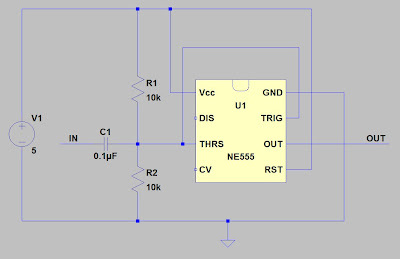 Inside the 555 timer is a 3-way voltage divider that provides the hysteresis thresholds. When the input voltage is above 2/3 Vcc, the 555's output goes low. When the input is less than 1/3 Vcc, the 555 output goes high. 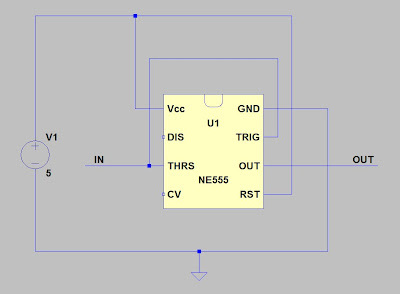 But the 555 won't trigger for my 1.8V encoder signal which is below the 2.2V threshold. It won't work at 5V either. What can we do...? 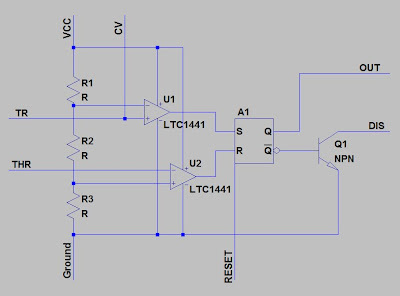 By passing the signal through a capacitor, low frequencies (including DC) are filtered. If this high-pass signal is fed in between a voltage divider, it adds a dc offsets to the signal. If the offset is 1/2 Vcc then the new peak voltage will be 0.9 + 3.3/2 = 2.55V, more than enough to trigger. The lowest voltage will be 3.3/2 - 0.9V = 0.75, well below the 1.1V lower threshold. 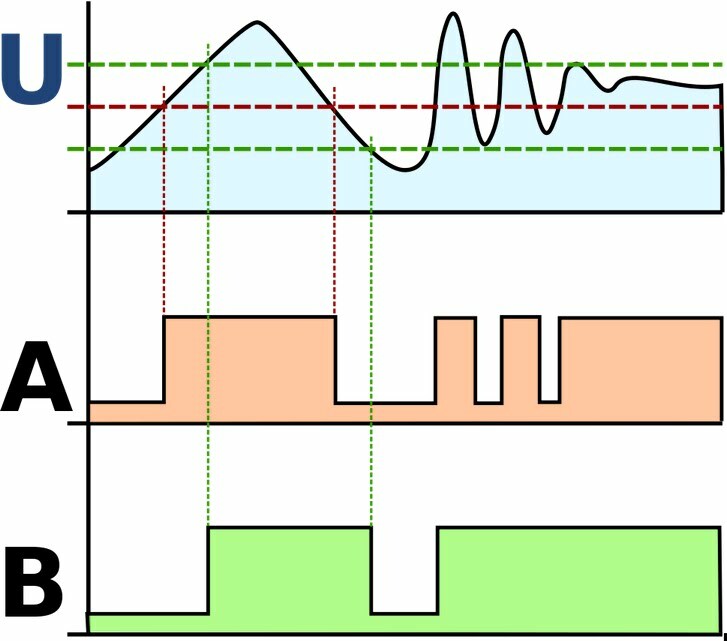 In the LTSpice simulation below, the red trace is the low threshold, the blue trace the high threshold, and the green trace is the signal with the dc offset. So we're done. Let's build the board and move on, right? Wrong. 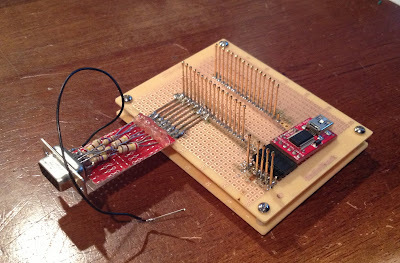 I prototyped the circuit on a breadboard and found out it doesn't work like I want. At low wheel speeds, the 555 doesn't trigger at all. Why? In the picture above, the red trace is the signal coming out of the high pass capacitor. Because the wheel speed is so low, most of the signal is low frequency and thus filtered and thus too small to trigger. So, all you have to do is slap a big capacitor in place of the small one, right? With a capacitor that's large it can trigger on low wheel speeds, yes. However, it can can also get the 555 output "stuck." Stuck? Yeah. If the robot sits with the input low too long, the 555 won't trigger for a long time after the wheels start spinning. 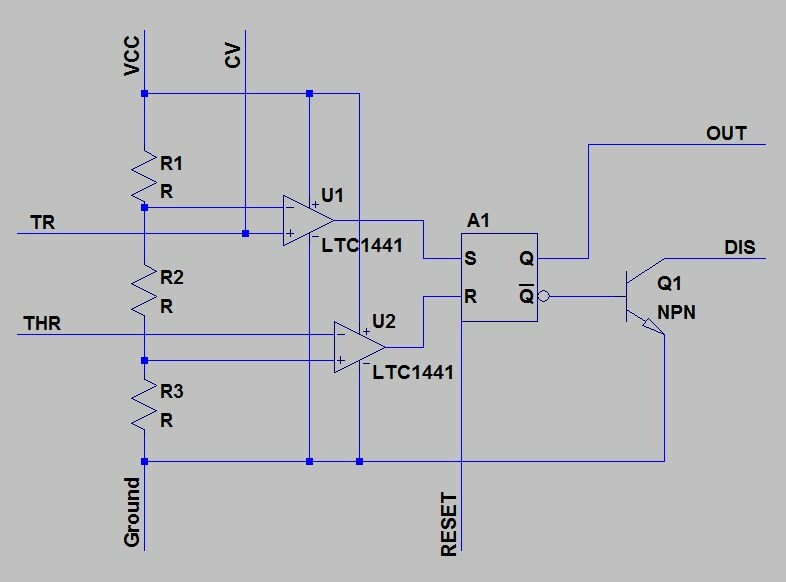 The reason is that, with the input voltage low, DC offset increases (the series capacitor charges) until the low voltage is now the new DC offset. 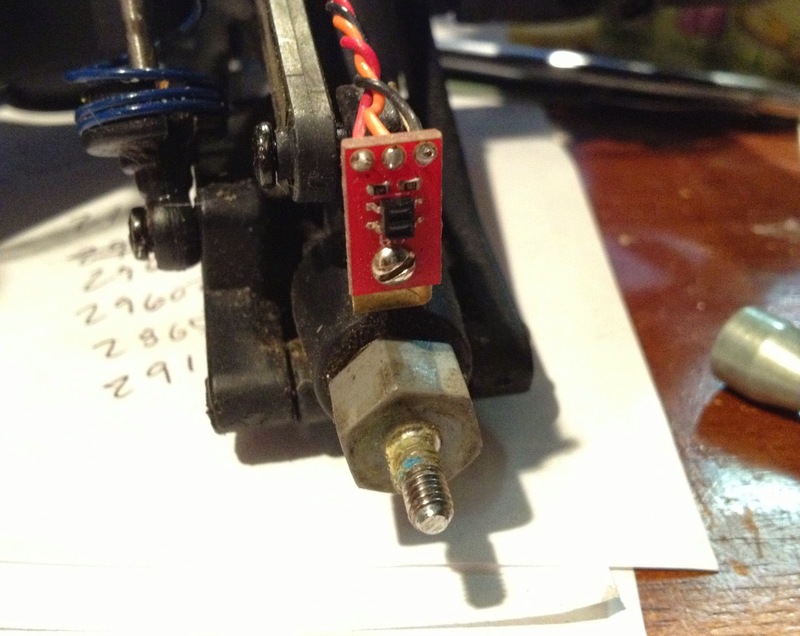 When the wheels start moving again, it takes a long time for the circuit to bleed off the DC offset. This is the simulated result with a large capacitor, 220uF. It mirrors the real life experiments I did. A smaller capacitor reduces the effect. Here's a 47uF capacitor. This also shows the output of the 555. The simulations do a good job of approximating what I'm seeing in real life. 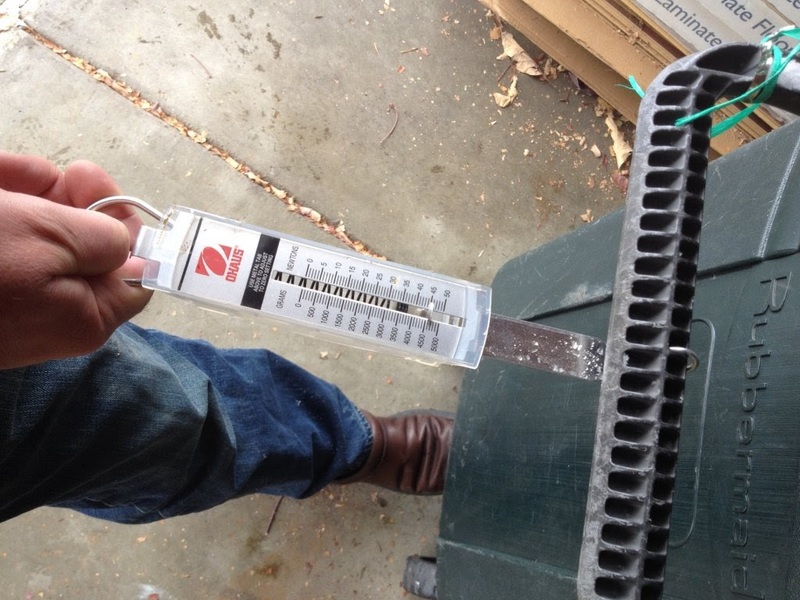 Bottom line: you have to find the right capacitor for your needs. A small cap would work on Data Bus. It goes fast, and is only stopped at the starting and finish line. Still, I don't really like this circuit for wheel encoders. I'd prefer to fix the problem with the first circuit. Using an NPN transistor to amplify (and invert) the phototransistor signal works well. It's not revolutionary although I didn't notice any similar circuits when searching for 555 Schmitt Trigger circuits. So, here it is. 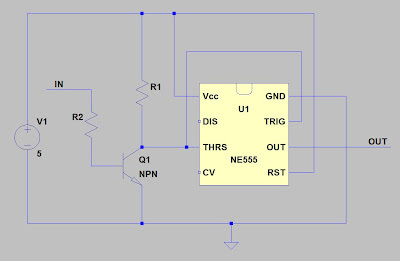 Connect the base of the NPN through a resistor to the encoder board output, tie the collector to Vcc through a resistor, and the collector becomes the output for the 555. Simple, eh? 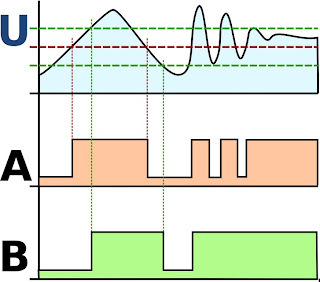 The Q1 transistor is either nearly 5V thanks to the pullup, or nearly 0V when base current is permitted to flow by the QRE1113 breakout board. As a result, the circuit triggers at the lowest practical wheel speeds and doesn't lock up. Seems reliable enough to use. The only downside is that the duty cycle isn't even close to 50%, although no circuit is going to get it perfect. One can address this issue in software. With a pulse train that isn't a 50% duty cycle, calculating speed and distance is probably best done by timing either rising edges or falling edges, but not both. 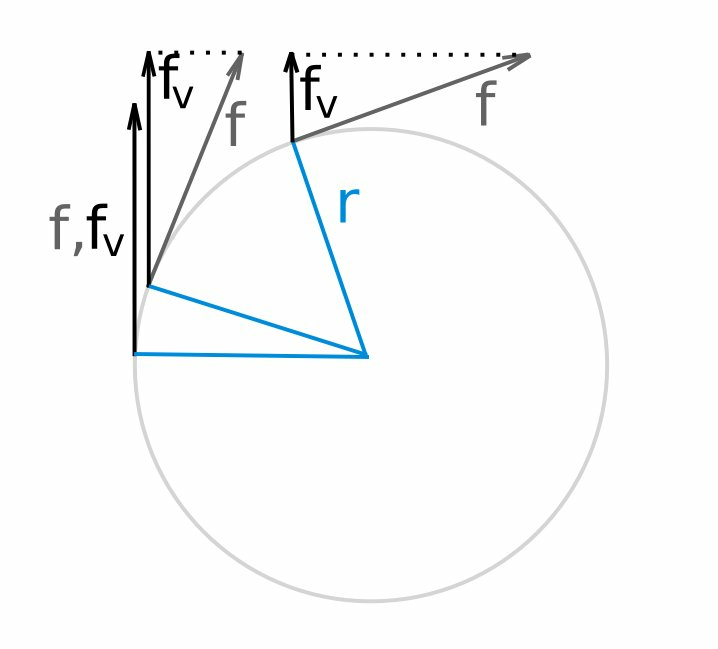 The longer the robot travels on a particular leg of its journey, the less jitter affects distance calculation. For speed, it may be wise to adjust control loop timing, encoder resolution, or robot speed ranges to adequately filter jitter and other noise. A slow robot needs more stripes, a fast robot needs fewer. A slower processor needs fewer and/or slower. Think about how often the MCU has to sample encoder counts to adequately filter noise and calculate speed with acceptable accuracy, given the number of stripes and the robot's typical speed range. And maybe filtering isn't even necessary. If a speed PID controller is adjusting a robot's speed at every edge, jittery speed adjustments between edges may be effectively filtered by the momentum of a fast, heavy robot. If the robot is slow and very light, momentum won't filter jittery speed changes very well. Software can do it instead. Change speed based on a running average, leaky integrator, or other software filter. Or, the PID controller can check speed by timing many pulses instead of few. Wheel imperfections and encoder disc mounting imperfections cause a low frequency modulation of the encoder signal. Sent through a Schmitt trigger, the output pulse width will vary. That sort of jitter may be a problem when precisely traveling short distances at slow speeds. More precision in the assembly may help. Or increasing the encoder resolution. The 555 is quite the Swiss Army Knife of ICs. 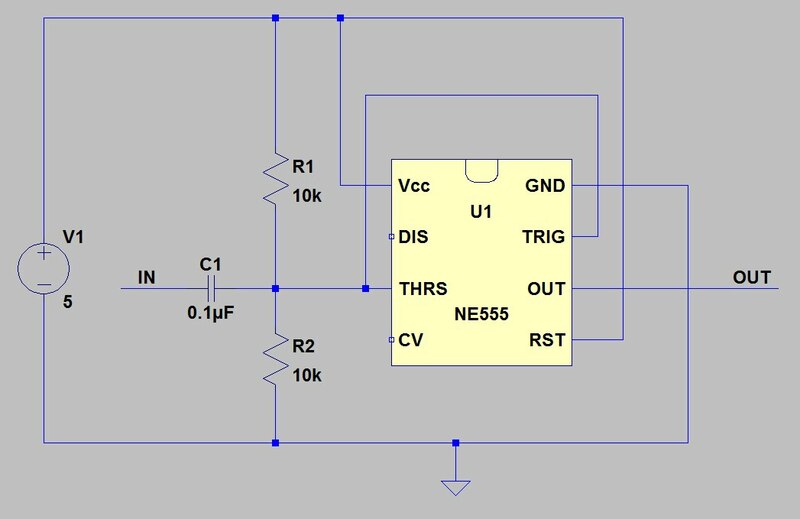 Acting as a Schmitt trigger is one of its many capabilities. With all that said, it's probably just as easy to just use a Schmitt Trigger inverter instead of the 555. I'm looking into that next.